ACRF was founded in October of 2005 in response to a massive tsunami that struck the island of Sumatra, Indonesia, in December 2004. Since then, ACRF has continued to grow and to serve to orphans and other children at risk in disaster-prone and economically-weakened areas of South East Asia. ACRF matches these children with caring, loving sponsors who, through monthly contributions, assist them with their needs, providing opportunity to heal, thrive and gain a new hope for the future. Through these efforts we hope to see many lives touched for the Kingdom. Please, contact us today to see how God would have you become directly involved in the life of a young boy or girl at risk. 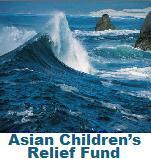 Checkout our blog at Asiancrf.blogspot.com. Jim passed away on February 21, 2016.